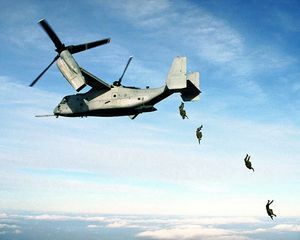 قوات مشاة البحرية الأمريكية (United States Marine Corps) أو ما يعرف بالمارينز هي أحد الفروع الأربعة للقوات العسكرية الأمريكية، تخضع جزئيا لقوات البحرية (United States Navy) خاصة في الأمور غير القتالية. يعمل في سلاح مشاة البحرية الأمريكي 190،000 الف جندي في الخدمة الفعلية و40،000 الف جندي في الاحتياط. ويقع مركز قيادة في أرلينغتون بولاية فيرجينيا وتضم مكاتب القيادة والتحكم. 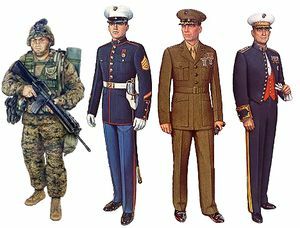 The United States Marine Corps traces its roots to the Continental Marines of the American Revolutionary War, formed by Captain Samuel Nicholas by a resolution of the Second Continental Congress on 10 November 1775, to raise two battalions of Marines. 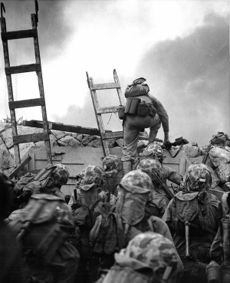 That date is regarded and celebrated as the date of the Marine Corps' birthday. 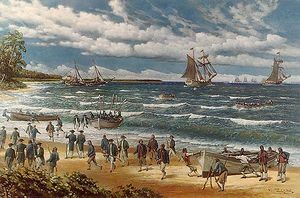 At the end of the American Revolution, both the Continental Navy and Continental Marines were disbanded in April 1783. The institution itself would not be resurrected until 11 July 1798. 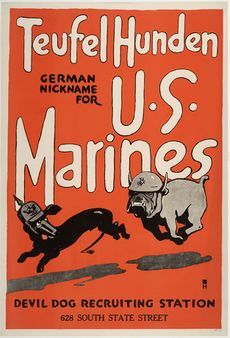 At that time, in preparation for the Quasi-War with France, Congress created the United States Marine Corps. Marines had been enlisted by the War Department as early as August 1797 for service in the new-build frigates authorized by the Congressional "Act to provide a Naval Armament" of 18 March 1794, which specified the numbers of Marines to recruit for each frigate. British and American troops garrisoned aboard Hornet and Penguin exchanging small arms musket fire with Tristan da Cuna in the background during the final engagement between British and American forces of the war. During the War of 1812, Marine detachments on Navy ships took part in some of the great frigate duels that characterized the war, which were the first and last engagements of the conflict. Their most significant contribution, however, was holding the center of General Jackson's defensive line at the Battle of New Orleans, the final major battle and one of the most one-sided engagements of the war. 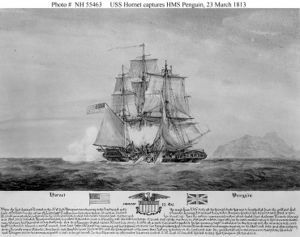 With widespread news of the battle and the capture of HMS Cyane, HMS Levant and HMS Penguin, the final engagements between British and American forces, the Marines had gained a reputation as expert marksmen, especially in defensive and ship-to-ship actions. 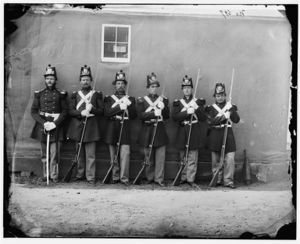 Five Marine privates with fixed bayonets, and their NCO with his sword at the Washington Navy Yard, 1864. The Marine Corps played a small role in the Civil War (1861–1865); their most prominent task was blockade duty. As more and more states seceded from the Union, about a third of the Corps' officers left the United States to join the Confederacy and form the Confederate States Marine Corps, which ultimately played little part in the war. 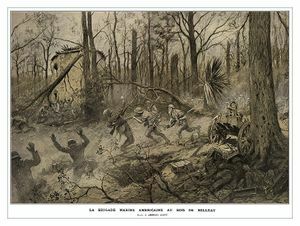 The battalion of recruits formed for the First Battle of Bull Run (First Manassas) performed poorly, retreating with the rest of the Union forces. Blockade duty included sea-based amphibious operations to secure forward bases. 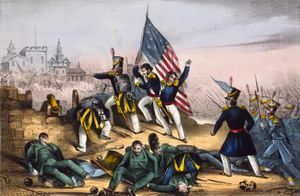 In late November 1861, Marines and sailors landed a reconnaissance in force from the يوإس‌إس Flag at Tybee Island, Georgia, to occupy the Lighthouse and Martello Tower on the northern end of the island. It would later be the Army base for bombardment of Fort Pulaski. 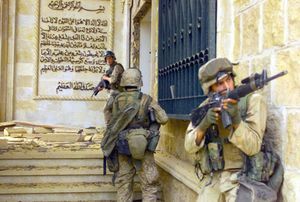 Warrant Officers are primarily former enlisted experts in a specific specialized field, and provide leadership generally only within that speciality. 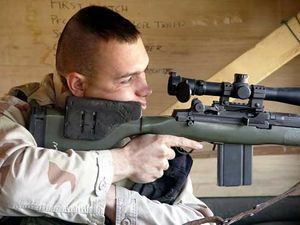 The basic infantry weapon of the Marine Corps is the M16 assault rifle family, with a majority of Marines being equipped with the M16A2 or M16A4 service rifles (the M16A2 is being phased out). The M4 carbine, a compact variant of the M16, has also been issued. The standard side arm is the M9 pistol. Suppressive fire is provided by the M249 SAW and M240 machine guns, at the squad and company levels respectively. In addition, indirect fire is provided by the M203 grenade launcher in fireteams, M224 60 mm mortar in companies, and M252 81 mm mortar in battalions. The M2 .50 caliber heavy machine gun and MK19 automatic grenade launcher (40 mm) are available for use by dismounted infantry, though they are more commonly vehicle-mounted. Precision firepower is provided by the M40 sniper rifle and M82 anti-materiel rifle by Scout Snipers, while designated marksmen use the DMR (being replaced by the M39 EMR), and the SAM-R.
^ "Armed Forces Strength Figures for October 31, 2010" (PDF). Military Personnel Statistics: Active Duty Military Strength by Service. U.S. Department of Defense. October 2010. Retrieved 13 December 2010. ^ "Reserve Force Figures" (PDF). The Continental Marine Magazine - Almanac 2010. Marine Forces Reserve. 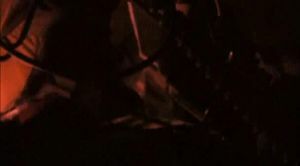 2010. p. 9. Retrieved 27 December 2010. 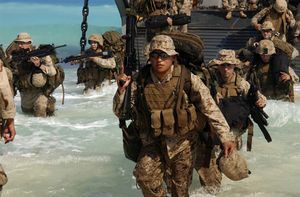 The Selected Marine Corps Reserve has approximately 39,600 Marines; the Individual Ready Reserve has approximately 60,000 Marines. ^ Lejeune, Major General John A (18 April 1925). "Marine Corps Order No. 4 (Series 1925)". Commandant of the Marine Corps. United States Marine Corps History Division. Retrieved 2 February 2010. ^ Loredo-Agostini, Sgt Heidi E. (30 July 2009). "Ready for the Corps: Marines recruit latest mascot from South Texas". Recruiting Station San Antonio. Castroville, Texas: United States Marine Corps. Retrieved 22 December 2010. ^ Dobbs, LCpl Chris (25 July 2008). "Marine Barracks’ mascot, Chesty the XII, retires after more than 40 ‘dog years’ of faithful service". Marine Barracks, Washington, D.C.: United States Marine Corps. Retrieved 22 December 2010. ^ U.S. Congress (11 July 1798). "An Act for Establishing and Organizing a Marine Corps". ^ Captain John Barry (9 February 1798). "Muster Roll of Officers, Petty Officers, Seamen, and Marines, on the Frigate United States". Retrieved 16 May 2009. ^ U.S. Congress (18 March 1794). "Act to provide a Naval Armament". NARA. Retrieved 16 May 2009. ^ أ ب ت Simmons, Edwin H. (2003). The United States Marines: A History, Fourth Edition. Annapolis, Maryland: Naval Institute Press. ISBN 1-59114-790-5. ^ "Top Marine Glad to Have M16A4 Standard". Kit Up!. Military.com. Retrieved 27 April 2010. ^ "M40A1 Sniper Rifle". USMC Fact File. U.S. Marine corps. Archived from the original on 25 February 2007. Retrieved 3 August 2008.